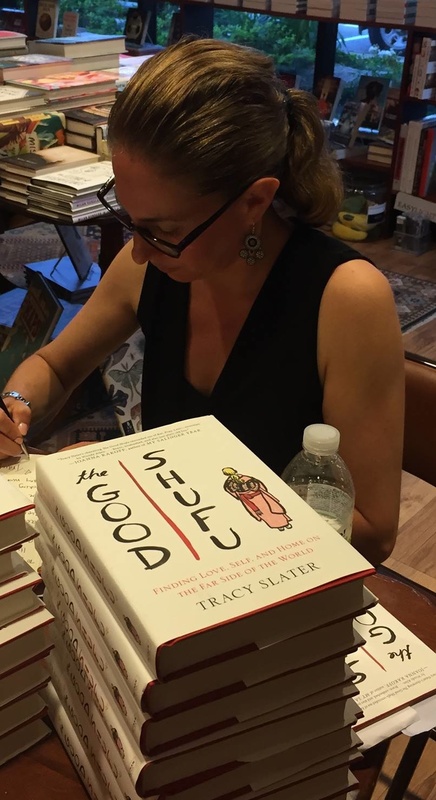 I’m Tracy Slater, a writer caught between Boston (my home) and Japan (my beloved’s). Once upon a time, I founded the award-winning, global literary series Four Stories. In 2005, within a matter of months, I went from being a highly independent woman in Boston with a Ph.D., a job teaching writing to graduate students, and a great circle of like-minded friends, to a woman who couldn’t read, write, have a conversation with the neighbors, drive a car, or go to the bank myself. In other words, I became a foreign wife in Japan: a gaijin shufu (literally, an “outside-country-person housewife”). Love the way you start Tracy! I’m at work on a memoir to mark 25 years in Japan on a very similar topic– life in orbit around my Japanese in-laws. I’m amazed as I read your story how the similarities in our plot lines will yield such incredibly different stories. Congratulations and much success. Thanks so much, Liane! I’m still getting used to how WordPress works, so I’m not sure whether this reply will just go to your inbox, but I’d love to hear more about your memoir project! How far have you gotten? (I’m only 4 chapters in…) And I love that you are focusing on your in-laws in part. My father-in-law is a big part of our life, and I adore him, but can barely communicate with him! Anyway, would love to hear more of your story. Are you blogging it at all? HI Tracy. Yes, you’re coming in wonderfully clear. WordPress is great. I use it for my art-related activities http://www.genesiscards.com and also thinking to add a heading to share my writing. My book began last June as it became sadly clear that my father-in-law had only weeks to live. I felt that I had so much to thank him and my mother-in-law for beyond so much material support. Their financial generosity made our life more comfortable but I felt somewhat dissatisfied with seeing my relationship with the inlaws solely on money terms. The deep changes to the way I relate to the world remained concealed until I started to write down the stories of their generosity of spirit . I’m 50,000 words into the telling of the story–although on Friday I zapped 10,000 off the screen and into a separate folder. It’s very tempting to write off-topic, side-adventures that may be self-contained short stories at some point. This is a home-based story. The Wakabayashi family reshaped my understanding of “home.” Being a homebody, a work from home mother, an artist with a home studio, home-based English teacher, not to mention a house wife, feeling “at home” in Japan is at the core of my well-being. Or so I thought. This book is about how I learned to become at home with myself. Finding the ideal home took the form of an outward search, moving umpteen times under the sweet but misguided assumption that if I found the ideal house I enter the ideal chapter of my life in Japan. For years, the family tried to convince me that my house was their house, their 6 floor business property in the utility pole wonderland of Okachimachi, an area of Tokyo that rubs me the wrong way because of its lack of greenery. You’d think I was crazy and the family were living in Nirvana from the way they spoke of their neighborhood. They see past the bleakness. Finally, after two decades I’m coming to understand that the Nirvana they experience is their own contentment from within that comes from being good friends, good neighbors, an awesomely supportive patriach-matriarch team. I’m writing about the family with much appreciation as I recall some tough life lessons that led to changes of heart and an about-face toward Jewish life. I’d be happy to share with you some of the writing, especially parts that would benefit from an impartial reader! I loved your start on wordpress and I feel safe to say that our stories may be close as cousins but we are telling very different tales. I’ve been in Japan 25 years anchored like a boat in Tokyo harbor. You’re going back and forth with enviable feet in both worlds. I’ve never lived back in America because the opportunity never arose. I can now see how this anchoring in Tokyo helped me turn inward and focus on creating the kind of family life I never had as a child. Despite my cheekiness, my queenly airs, my complaining nature, I received unconditional love from the Wakabayashis for more than two decades! They deserve a medal! Instead my mother-in-law gets this book and my father-in-law hopefully will read this book too in his now angelic state. Truly a miracle to be not only tolerated but gently to shift into awareness of our connectedness through subtle, gentle practices that I’ll describe in this book. My husband provided the drama and friction for me to constantly question why I was tolerating his abrasive communication style and his limited menu of things to talk about, a kaiten zushi repetoire that seems mouth-watering upon first encounter but becomes extremely bland when consumed on a habitual basis. And yet, we are entering our 24th year of relationship in a few months! I know what you mean too about adoring this father-in-law who you ‘can’t communicate’ with. It’s because his actions come from the heart. Instead of words we glide along in this society through actions interactions, unexpected kindnesses that we receive and give. That’s my take. I detect that yours too is a tale of upliftment and this is truly wonderful news because by telling our stories with appreciation we are helping our readers reframe the unexpected twists and turns of their fate that lead to the wondrous and energizing life it truly is. So looking forward to continuing our correspondence! Thanks so much for sharing part of your story. It really does sound like our books share a lot of similarities! And I love that you are thinking a lot about your in-laws, too. I think with more and more people aging, both in the US and Japan, and people living longer, more and more people will be struggling with similar questions about how to make meaning out of the bonds we have as not-young-adults with our own parents or in-laws. Did you care for your father-in-law at all? I’ve been caring for him quite a bit, and he has Parkinson’s syndrome, so he has really declined. I know I’ll want to write about this somehow in the book–and specifically about how our dreams of caring for our own baby came to an end just at the time that we really had to start caring for my FIL as he became more and more incapacitated, and the complex set of feelings that have arisen because of that. I’m struggling with how to write about that and protect his dignity, though. How do you details someone’s physical decline without describing things they may not want others to know or think about them? Would love to know if you’ve struggled with this at all and any answers you’ve come up with! I accidentally deleted your last email! Could you resent as before to my private email address? Want to respond to you at length! Love your story. Very interesting. 🙂 Looking forward to more posts. Hi Tracy! I love reading your blog and have nominated you for the Liebster Award. Hope you’ll join in the fun: http://chinaelevatorstories.com/2013/08/17/the-liebster-award-and-blog-recommendations/. Keep up the good work! Hi R. Thanks so much for the nomination–very kind of you! And right back at you. Congrats on being nominated. Susan Blumberg also nominated my blog as well, Svetlana’s Reads and Views. I just wanted to let you know that I review Non-fiction and fiction literature in case if you’d like me to read and review your memoir. Thanks and looking forward to hearing from you! Happy Yom Kippur by the way and good luck. Hi svetasbooks. I’d love to have you read and review the memoir when it comes out. I’m handing the full manuscript into the publisher at the beginning of Dec (a month early now due to the unexpected developments in the story I mentioned in my last post), we’ll edit the book together for a month or two, and then it will go into production, so it won’t be out until 2015. Please do keep in touch though in the meantime. All my best! Thanks so much, Hilary! I so appreciate your support. Thank you, Kathleen! Greetings back to you from Osaka! All my best.